On July 4, the kids and I went to Rome, NY, to the Erie Canal Village. I’ve blogged about our day there, Part 1 and Part 2. What an adventure it was! One of the best parts was riding the horse-drawn packet boat down the sliver of the old Erie Canal. Here’s a video I made of the idyllic experience. If it wasn’t for the power lines in the meadows and the sounds of traffic on the roads, you’d think you were transported back to 1830 or so, at the height of the Canal’s popularity. The ride was so peaceful and the scenery so beautiful, I wish it would never stop. You’d never know it today, but before the Erie Canal, traveling west from the eastern seaboard of the United States was almost impossible. The Adirondacks to the North all the way to Canada barred the northern pass, and the Appalachians from Canada down to the Carolinas were impassable until the airplane was invented. The only way west was through Central New York, and that was by oxen-driven carts or wagons. I wrote a post about the uniqueness of the Mohawk Valley geography and the transportation boom here. 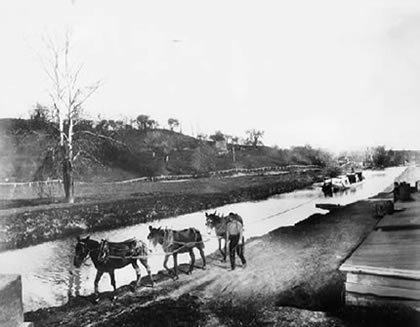 The Erie Canal was the brainchild of decades of inspiration and planning by some of our newly independent and ambitious American forefathers. When the plan was finalized in 1817 and the first shovelful of dirt removed (in Rome, where the Erie Canal Village is located), some scoffed and said it could never be done. President Thomas Jefferson said it was “little short of madness to think of it!” New York State is rugged country– millions of tons of soil and solid rock had to be removed; millions of gallons of water from swamps and rivers had to be reorganized and displaced. Where the Canal had to cross over bridges, aqueducts were created and the waters of the Canal elevated; where mountains stood in its way, dynamite blasted the New York bedrock into movable pieces. This was before bulldozers and cranes. Thousands of men lost their lives to accidents, disease, and exhaustion. 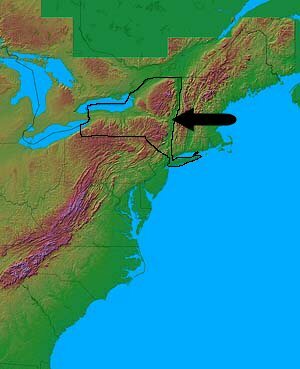 New York State is not flat land– it’s very mountainous. Our highest point is Mount Marcy in the Adirondacks, at 5,344 ft, and we have all mountains and hills in between. 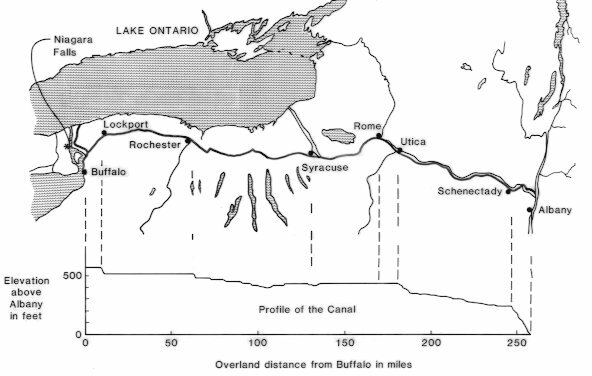 If the Erie Canal was to be built straight across the state, all the waters of Lake Ontario would soon drain into the Atlantic Ocean, like a waterfall, lol! Thus, the “canal lock” was created. There’s a good explanation about how the locks work here. I found this cute animated icon that helps. Some called the Erie Canal the Eighth Wonder of the World. Many had said it couldn’t be done. The completion of the Canal and the burst of business it brought catapulted New York State into fame and riches, earning its nickname, “The Empire State.” All the wealth of the Westward Expansion passed over New York State soil. Before the Erie Canal, New Orleans was the nation’s biggest harbor; after the Erie Canal, Upstate New York thrust New York City into the limelight, and its harbor became one of the largest in the world. Today, most of the old Canal is in ruins. Some has been preserved for tourist attractions, like the Erie Canal Village in Rome. Some has been modified for recreational boating uses. The canal was rerouted for heavy cargo passage and renamed The New York State Barge Canal, but interest in the Canal waned because of faster methods, like railroad, and then trucks. Interestingly, because of high gasoline prices, transporting of goods by the canal is seeing renewed interest. I have been browsing for info about the canal before I come home to upstate (Moravia). I am wanting to take my 11 year old twins on the “barge ride on the canal. Thanks for the review. I look forward to the ride, I hope it make as much an impact on them as it did for me when I was a kid and for you 7/4. I now live in Dallas/Fort Worth. Funny how you appreciate New York so much more when it’s so far away. New York is SOOOOOO beautiful. It is a tragedy in the highest that the government here is so bad. Thanks for your comments. I hope you get to enjoy the canal! There are many museums and parks that still retain portions of it. Wow great pictures, PA have a same canal down at New Hope. They still use it for tourist. The boat is being pull by donkeys or horses too. BTW, thanks for stopping by. Yes, I was sad about it. But there are other, like Chuck Baldwin and Barr (can’t remember his 1st name). I didn’t see any mention of the fact it also got named Clinton’s Ditch. Being nicknamed, in a critical way after the New York Governor who got the project going. The fact that it was so successful is indicated by the name of Clinton Ditch Co-operative, better known as the producers of Pepsi Cola! the recent and current government of New York has enough trouble keeping the state going, say nothing about trying to re-develop the Erie Canal, though Pennsylvania has the National Historic Park, Steam Town in Scranton, that is Federally funded, perhaps the National Parks system should also think of including the Erie Canal in it’s National Park System and perhaps that could help with a re-development plan, it certainly changed the nation, not just New York. Enjoyed your video so much. My great grandfather traveled on the Erie Canal in 1854 with his family going to Lafayette, Indiana. It was a great experience being able to watch your video and feel like I made a little part of the trip as well. Great piece. I’ve always had a great interest in the Erie Canal and would love to take a ride. Can anyone tell me what time of year the ride is offered and a schedule if possible? Is there a ride that goes through any of the locks? That would be awesome! The history behind the making of the canal is fascinating. I volunteer at the Erie Canal park in Camillus, NY. I am also a wool handspinner and am interested in hand spinning related to Erie Canal life around 1830 or thereabouts. Hello, Dorothea! Thank you for your comment. That’s so wonderful that you volunteer at the Erie Canal Park! We have yet to visit it.